Wedding Jewelry and AccessoriesThere are 5 products. Wedding Jewelry and Accessories, Handmade Wedding Jewelry, Wedding Bridal Jewelry - you can buy the finest designer and handmade wedding jewelry at e-shop Unikatnica.com. Are you preparing for one of the most beautiful moments of your life? Are you planning to get married in a couple of day, weeks or months? Then you must be searching for unique and special Wedding Jewelry and Accessories. Handmade Wedding Jewelry from Unikatnica is a very special designer Wedding Bridal Jewelry, which is elegant, unique and completely different wedding jewelry from all others you have seen. 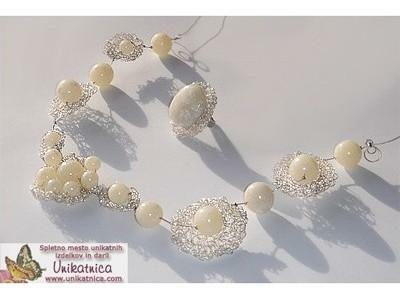 Why not choosing unique handmade jewelry from Unikatnica - you are definitely going to attract the attention of all the quests at your wedding and especially - your love one. Unique handmade wedding jewelry from the newest collection is made in white, translucent, beige, light-grey, silver, light-blue, cyclamen and gold colour. All wedding jewelry is made from skin friendly materials and is nickle-free, that is why it can also be worn by people with allergies. Handmade wedding jewelry is made from crochetted wire and polymer clay. It is a set of a wedding necklace and unique wedding ring with unique designer pattern of small flowers. The product is made of skind friendly materials and is nickle free. Unique, handmade wedding jewelry in the shape of an ellipse in white&silver colour - a wedding ring and earrings with unique designer pattern and shape. The product is made of skind friendly materials and is nickle free. Handmade wedding jewelry (a wedding necklace, a unique wedding ring) with unique designer pattern and shape. The product is made of skind friendly materials and is nickle free. Unique, handmade bracelet with unique pattern in pearl colour. THe Braceet is made from Cernit Clay and skin friendly materials which are nickle-free. Handmade wedding jewelry (a wedding bracelet, a unique wedding ring and wedding earrings) with unique designer pattern and shape. The product is made of skind friendly materials and is nickle free.